The reports help us track our progress while showing others how to grow a side project into a full time business. As this is the first of our monthly updates, there isn’t much to compare the statistics to so this is more of a starting point to build from. After last months revenue of $675 this month we set the goal of $1,350, double the amount. It feels amazing to say we managed to surpass the goal and hit $1,425 in revenue! 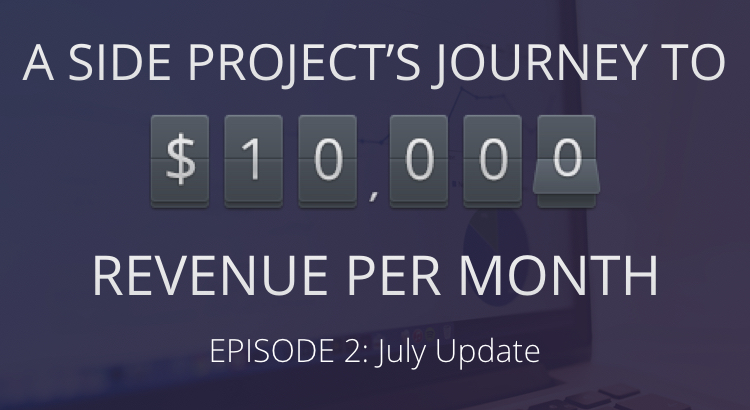 That’s a 111% increase on June’s revenue! The month started off well with a steady stream of new orders for the first couple of weeks. Towards the middle of the month, things started to slow down but we recovered by landing a large order from a big client in the last week. We had some very positive feedback from clients who were more than satisfied with their geofilters. Receiving feedback from happy clients makes all the hard work worth it! In July we started 2 new blog series to keep the site content fresh. This first series is the one you are reading, Journey to $10,000, and the second is the Snapchat Influencer Q&A. The Snapchat Influencer Q&A got off to a great start with interesting interviews from Erica Blair on Personal Branding, Justin Wu on Growth Hacking on Snapchat, and Jonathan Caras on How Snapchat is changing the way we communicate. Our aim is to keep the Influencer Q&A running with new guests weekly. This series will be updated monthly and other topics that we think you may find interesting posted as they come about. After trying every CRM with a free trial I could find and not being satisfied, we created our own system using Trello. Trello is an amazingly useful free resource intended to be used for task management. I will go into more details about this in a future post. As the month went on and we had to deal with more and more clients, we discovered what worked and what didn’t. After experimenting with tools such as Zapier, we have an efficient, streamlined process. On one occasion we submitted a design and it got approved, only to be rejected later as it was promoting drinking alcohol. The design including a small red cup which is why it was rejected. It would be understandable although some designs that were approved included champagne glasses and wine bottles. So we were shocked to hear that they had an issue with the red cup. Facebook Ads seem like the best form of paid ads for us and we are still A/B testing different designs, CTA’s and offers etc. The revenue target for August is $1,800. A 26% increase on July’s revenue. It will be tough as it seems like there is more competition everyday, but I’m confident in our ability. July was a good start to the series. We hit the revenue target although if we didn’t land the large order towards the end of the month we would have fallen short.